Gary Blackman, left, relaxes on a bench from My Heart in a Suitcase, while his twin brother Mark poses with a balcony window from Otherwise Known as Sheila the Great. They are the founding co-directors of ArtsPower National Touring Theatre, based in Cedar Grove. Cedar Grove, NJ – ArtsPower National Touring Theatre began in 1985 as a grassroots production company in South Florida, primarily serving small arts communities in the South. Today, the Cedar Grove-based, nonprofit organization, tours nine productions annually nationwide. On average, a new show is added each year. 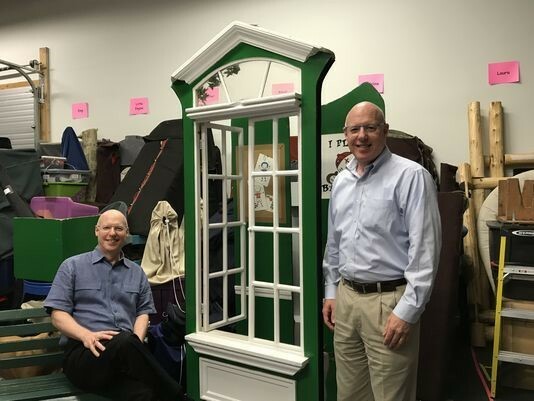 The family-based productions, primarily musicals, have been staged in every state but Hawaii, according to founding co-directors Gary and Mark Blackman. It’s a highly competitive market that caters to first-run performing arts centers, along with university and school auditoriums. “Our success is based on quality shows and literary titles that audiences seem drawn to,” Gary said. Many productions are based on beloved children’s books, including authors Judy Blume, Lois Lowry, Paula Danziger, E.L. Konigsburg, Patricia Reilly Giff, and Tammi Sauer. The stories, told in one hour and in one act, include entertaining fare with simple lessons in humanity for the pre-Kindergarten to sixth-grade set, as well as more serious themes for older children and families. The latter includes Four Score and Seven Years Ago, about slavery during the Civil War, and My Heart in a Suitcase, about children separated from their parents during the Holocaust. ArtsPower supports the performances with “Study Buddy” guides to help teachers integrate the subject matter and themes into classroom lessons and discussions. In addition to Four Score and Seven Years Ago and My Heart in a Suitcase, tours for the 2017-18 season include the new Nugget & Fang, Biscuit, Are You My Mother?, Harry the Dirty Dog, and Judy Blume’s Otherwise Known as Sheila the Great. Nearby New York City theater talent drew the twin brothers to New Jersey. They set up their staff, and set and prop storage, in Ridgewood, Montclair and Verona, before settling on Sand Park Road in Cedar Grove’s commercial park in 2012. Gary lives in Glen Ridge; Mark resides in Montclair. As jazz musicians, they started ArtsPower on the strength of their music touring knowledge. Artistic Director Greg Gunning joined in 1989, when the organization did its first national tour. Company and Production Manager Karen Bibbo, and Booking Associate Suzanne Tuck, round out the staff. Show development usually begins in the summer prior to a tour, according to the Blackmans. The co-directors work to secure a story’s rights and begin raising money for the project through grants and individual donations. As NorthJersey.com recently reported, the New Jersey Council on the Arts recently awarded the organization $49,138, an example of such funding. Work begins on a new show’s script in June. The script is sent to the musical composer by early August, followed by a workshop and booking of the first tour. The orchestrations are recorded between Thanksgiving and Christmas. The musical comes together with auditions and rehearsals in New York City, where the talent is plentiful, according to the brothers. Gunning oversees the new show’s direction, and temporary hires direct the reprises, they said. “This is the same model we’ve worked with for 30 years,” noted Mark. Keeping it simple, each of the nine touring companies includes a stage manager and four actors, along with sets and props, which the actors can easily move themselves. ArtsPower’s tours being booked for the 2018-19 season include the new Your Alien, Madeline and the Bad Hat, Laura Ingalls Wilder, Amber Brown is Not a Crayon, and Anne of Green Gables.